The S&P snapped a five-day winning streak on Wednesday with a loss of 0.22%. All three of the other main indices fell as well. The Nasdaq suffered the biggest decline at 0.36% and it was followed by the Russell with a loss of 0.15%. The Dow suffered the smallest loss at 0.08%. Six of the 10 main sectors fell yesterday with the communication services sector experiencing the worst loss at 2.24%. The energy sector was the second worst performer with a loss of 0.74%. On the plus side, after being the worst performer for two straight days, the healthcare sector was the top sector with a gain of 0.45%. The tech sector gained 0.34% and that was good enough for second best. The scans turned even more bearish last night with 95 signals on that side of docket with only five signals from the bullish side. The barometer dropped from -40.5 to -62 once these results were added in to the equation. 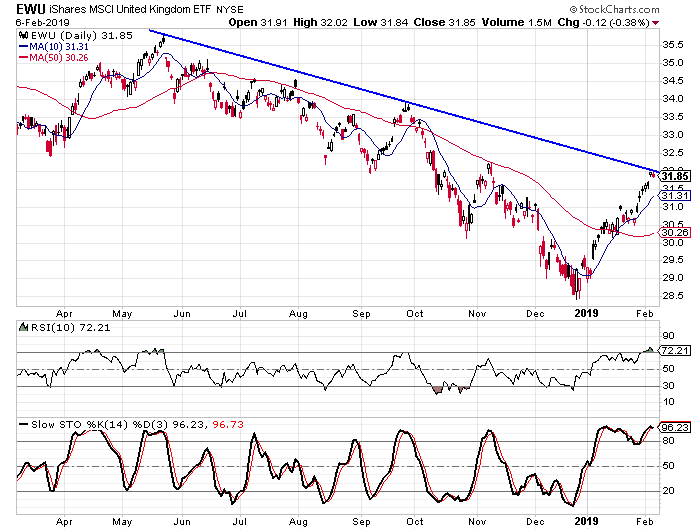 There were a number of charts that caught my eye last night, but the one that seemed to offer the best risk/reward scenario was on the iShares MSCI United Kingdom ETF (NYSE: EWU). The ETF appeared on the bearish list and as we know the Brexit negotiations are having a negative impact on the British market and economy. The daily chart shows how a downward sloped trend line has formed that connects the highs from May and September. The fund hit the trend line on Tuesday and then dropped slightly on Wednesday. I look for the fund to make another leg down in the coming weeks. Buy to open the April $33-strike puts on EWU at $1.70 or better. These options expire on April 18. The options will double if the fund falls to $29.60. I suggest a target gain of 100% with a stop at $32.20. For a limited time, get immediate access to "the best of" Stansberry Research's trading ideas. As one reader said: "I am 11 for 11 so far... in less than 2 months." Learn more here.